You have a Dry Fuel engine and now your steam’n has come to a halt for lack of fuel. Not to fear...we always have on hand, thousands of these little power pills to keep your engine going at full steam ahead! 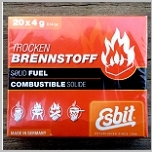 These fuel tablets are specially formulated to provide the proper temperature levels and burn duration, with no smoke or fumes. Always keep several boxes on hand, so you are always ready to power up that little Jewel for friends and family. Specially formulated for Jensen. High viscosity and high temp oil will not wash off like a light duty oil. 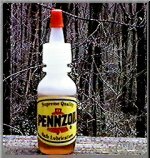 This is a necessity for maintaining any steam engine in its peak of proper health and performance. Each bottle comes with a dispenser cap. One bottle will last up to a year with normal use. Every Steam Engine needs oil and what better way to satisfy your Jensen steam engine's thirst than with an Official Jensen Steam Engine Oiler Can. 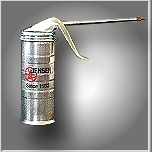 These high quality , new old stock, oiler cans were once ordered in bulk, to meet the needs of the Jensen Factory. We recently discovered a hidden cache and now you too can own this useful bit of Jensen history, from those bygone days. Designed by Tom Jensen, Sr. in 1948, is the finest miniature A/C "visible Generator made and the perfect accessory for turning our larger electrically heated steam engines into a miniature power plant. For additional Science Fair and Physics fun, this "Genset" can be powered by any external power source, such as an electric motor, hand crank, wind or water power. The perfect way to demonstrate the basic electrical principals used by Thomas Edison in the 1880's"